After engine was started, the light of front defogger would be flashing for about 1-2 minutes. During the light flashing, none of climate control buttons would respond when pressed. After the light stopped flashing and the ac was running, only cold air came out from the left and left-Center vents (driver side). But, Luke warm air came out from the right and right-center vents (passenger side) with the pretty much the same volume of the air as the left vents. Warm/hot air also came out of the vents for the back passengers. Are theses problems caused by faulty air mix servo motor? 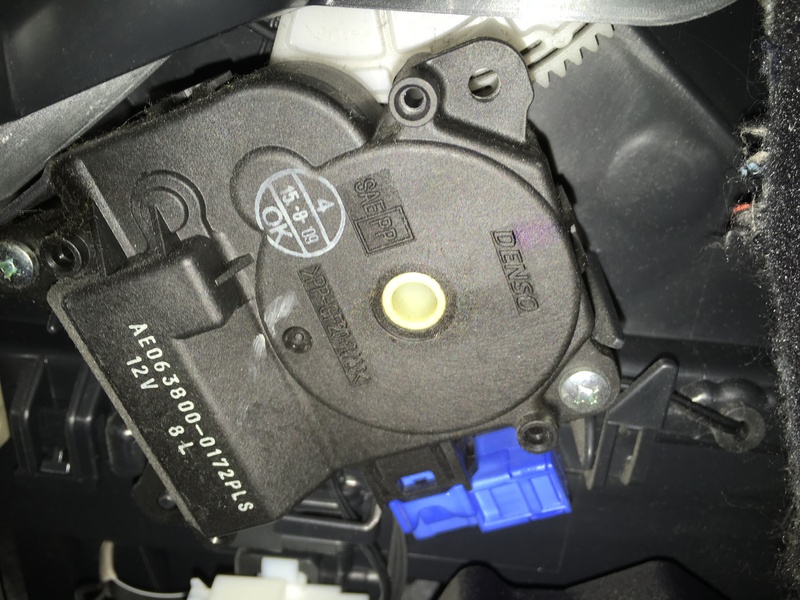 Does the Camry has single servo motor for all three sets of vents or it has separate an air mix servo mother for left, right and back each? The air mix servo controls air temp. Location is under dash, drivers side of center climate control console. Might be able to view its operation (or lack of) by operating the temp control. The manual controled unit has air mix, air intake (fresh, recyc) and air outlet servos. Operate the controls and determine if the only issue is the air temp. When selecting air outlet position, the air flow volume never fully turns off for any one vent system. It does increase or decrease depending on the selection. Thank you very much for your detailed info and suggestion. I will give it try when I have a chance. By the way, only when the air circulation was not set to "Closed", the front defogger light would be flashing at each start. The front defogger light would be flashing 36 or up to 40 times each time after a start. The ac air flow on the right center and right vents was indeed much less than the right ones. The right center vent was blowing luke warm air and the right vent was blowing warm, and the back passenger vent was blowing hot air while ac was running. Any further suggestions? Thanks. Upon start up, the climate system will adjust itself to the current settings. If unable to achieve the settings due to a failed component, stuck servo flapper, bad wiring, it flashes a light. On the off chance when investigating. Prior to starting position yourself or others to be able to listen under the dash. You might here the sound of something trying to move, but can't (stuck door). How old is your battery? It has happened an aging battery causes strange issues with the climate system. Thank you very much again your help with speedy reply. Very much appreciated. Just one day before I started this thread, the battery had been replaced with a new one. But, the air venting issues remain the same prior to and after the battery replacement. The air mix servo appeared to respond to the temp control **** on the driver side with full swing from one side to the other when adjusted from Lo to Hi and back. The air blowing out from the left-center, left and bottom vents changed from cold to hot and back accordingly to the vent setting. I did not hear anything additional or odd (like clicking) lnoise under the dash after turning on the ignition. Is likely that the art outlet servo is having the issue? Oops, I forgot to mention that the air mix servo did not respond to any temp adjustments on the know of passenger side at all. The air coming out of the back passenger remained hot once the engine warmed up. The air volume from the right and back passenger vents remained low (20% roughly) relatively to the driver side vents. Here is the picture of the air mix servo motor. The air mix box has 3 main air outlet ducts. These split off into outlets ducting for foot, dash and defroster registers. The outlets ducting for the foot and defroster have one air door each located at the air mix box. The outlet ducts for the dash have one each door for left, right and center registers along the ducting. The air temp going into the main duct will be the same. The air mix door (servo/temp control) only changes the air temp going into the ducts on the air mix box and nothing else. If the temp control is changing the air temp, then it appears to be working. security system key engine immobilizer faulty?